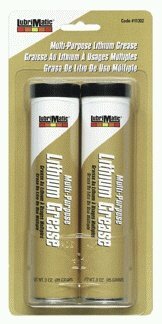 LubriMatic Multi-Purpose Lithium Grease is a long lasting, hard working formula and delivers high performance in a wide range of applications. It is recommended for chassis, universal joints, and other general purpose applications around the farm, home and shop. It works best for lubricating rolling parts. NLGI #1-1/2, drop point 350 degrees Farenheit. NLGI #1 1/2, drop point 350 degrees F.